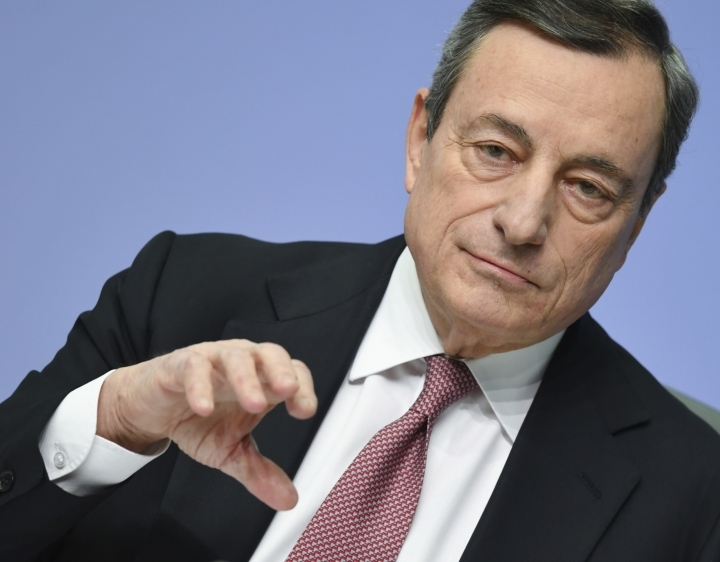 FRANKFURT, Germany — European Central Bank head Mario Draghi on Thursday issued a darker outlook for the region's economy and said the bank is ready to use all its monetary levers in case the slowdown takes a turn for the worse. Draghi said after Thursday's policy meeting that risks to the 19 countries that use the euro had "moved to the downside," dropping language from December's meeting that risks were "broadly balanced between better and worse outcomes. He said that the bank was ready "to adjust all of its instruments" in case of unexpected trouble. The slightly more pessimistic view fed suspicions among analysts that the central bank might wait longer before raising interest rates increase from the current record lows. Rather than late this year, the first hike could come in 2020, some say. "At this point in time, we're just assessing the situation," he said after a meeting of the bank's 25-member rate-setting council left interest rates unchanged. He said the meeting was devoted to assessing "where we are, why are we here, and how long will the slowdown last." There are some upbeat factors for the economy: rising wages and the ECB's continued low interest rates, which make borrowing cheaper. But, he said, they have to be balanced against uncertainty about Brexit and increasing trade protectionism. Both the ECB and the Fed are trying to withdraw stimulus measures deployed in the aftermath of the global financial crisis and the Great Recession without roiling markets. The eurozone grew a modest 0.2 percent in the third quarter from the quarter before, while unemployment in Europe has fallen slowly but steadily to 7.9 percent from its peak of over 12 percent in early 2013. Worries have been stoked by weak figures for industrial production in Germany and other key economies. Analysts say the ECB will likely trim its forecast for growth of 1.7 percent this year when it produces new estimates in March and might change its policy statement to push back interest rate expectations. One risk is from a possible chaotic departure by Britain from the European Union. British Prime Minister Theresa May has been unable to win parliamentary approval for a negotiated exit from the EU, raising the chance of departure on March 29 without any new rules on getting goods in and out of the country. Draghi said that the ECB had established a working group with the Bank of England to identify possible risks to the financial system from Brexit. He said that the European Commission had addressed one risk by ensuring that U.K. derivatives clearing firms could continue serving EU clients for a set period after Britain leaves the EU and its single market for goods and services. He said that other risk areas, such as derivatives trading not conducted through a central clearing party and insurance contracts "do present risks but they can be addressed and they are being addressed by the private sector." Draghi said that the impact on the aggregate EU economy "didn't appear too extensive." But he cautioned that there could be effects on supply chains and that some eurozone countries could be hit harder than others. The "protracted length of time" in settling the terms of Brexit "is not benefiting the overall economic climate in the U.K. but also in the euro area." Business confidence has also been hit by fears that the trade conflict U.S. and China will lead to more tariffs, or import taxes, that would lower global trade and growth. U.S. President Donald Trump has threatened to impose auto tariffs that would hit European manufacturers but has held off so far. The ECB kept its short-term benchmark rate at 0 percent. It also left the rate on deposits left overnight by commercial banks at minus 0.4 percent, a penalty aimed at pushing banks to lend excess cash. The bank has also said it will maintain the 2.6 trillion-euro ($2.95 trillion) pile of government and corporate bonds that it bought with newly printed money over almost four years. By reinvesting the principal as those bonds are paid off, the ECB maintains the level of monetary stimulus. The Fed, which also bought bonds, is already letting its bond pile dwindle as the bonds mature, taking it further toward a more normal monetary policy due to the earlier and stronger U.S. recovery. Banking Reporter is the largest-circulated online business news in the United States, bringing a whole new genre of business journalism more up close and more incisive. Copyright © 2015 - 2019 Banking Reporter. All Rights Reserved.